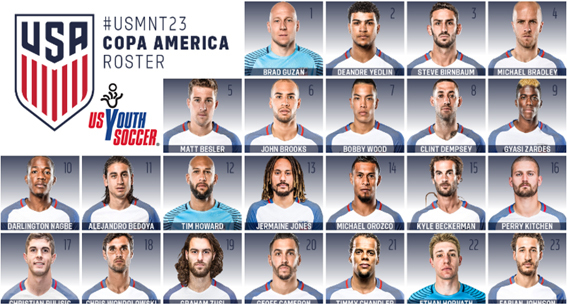 FRISCO, Texas (May 24, 2016) – Of the 23 players announced to the U.S. Men’s National Team COPA America Centenario roster, 17 have US Youth Soccer ties. The COPA America Centenario marks the 100th time the tournament will be played, making it the oldest international continental soccer competition. The hosts, United States, will play the opening match of the tournament June 3 against Colombia before taking on Costa Rica on June 7 and Paraguay on June 11. Fifteen players on the COPA America Centernario rosters are US Youth Soccer Olympic Development Program (ODP) alums, with the likes of Matt Besler, Graham Zusi and Bobby Wood attending US Youth Soccer ODP Interregional events. Zusi was selected as an All-star at the 2003 US Youth Soccer ODP Boys Interregional. In addition to ODP experience, 16 players on the COPA America Centenario roster have played in the US Youth Soccer National Championships Series (NCS). DeAndre Yedlin, Steve Birnbaum and Darlington Nagbe all played in multiple US Youth Soccer Regional Championships. Michael Bradley won the 2002 US Youth Soccer Region II Championships and placed third in the 2002 US Youth Soccer National Championships with Sockers FC (IL). Perry Kitchen won the 2005 US Youth Soccer Region II Championships with Chicago Magic (IL), while Alejandro Bedoya won the US Youth Soccer Region III Championships in 2004 and 2006 with Weston FC (FL).